When large international organizations have multiple buildings and meeting facilities, there is a challenge in staffing receptionists to communicate with visitors in multiple languages. 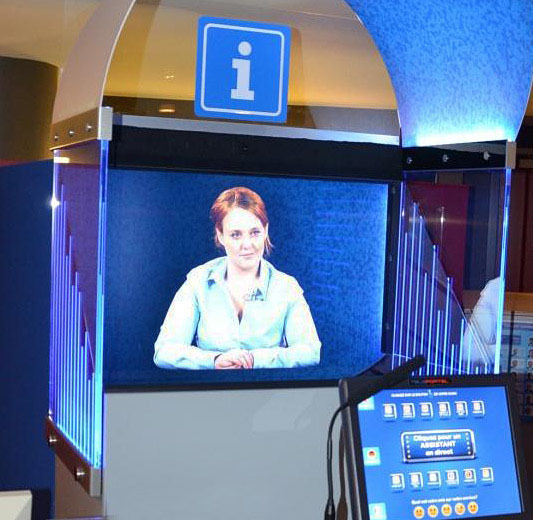 The European Commission selected the TelePresence Tech Holographical Reality Kiosks for the reception of the international representatives of the European Union at the headquarters in Brussels, Belgium. The TelePresence Tech Kiosks are positioned at the entrances to the meeting facilities in the European Commission buildings. If the EU agent appearing on the kiosk does not speak the language of the EU Member representative, another agent is instantly routed to appear at the kiosk. The European Commission have achieved significant savings with reduced staffing by using the TelePresence Tech systems while more effectively meeting the requirements of providing information in multiple languages for the EU Members.